The current Western interest in Buddhism and other Eastern religions is--among other reasons--both the result of and the stimulation for an entire library of books purporting to bring the Wisdom of the East to an audience for whom the wisdom of the West has failed. This book is not an example of that genre. It is an attempt to interpret Buddhism in the light of some current theories about religion. 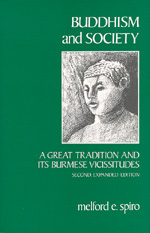 As a work of scholarship, rather than a homiletic tract or an apologetic treatise, its aim is to understand Buddhism as one historical variant of the generic human attempt to find meaning and hope in a sacred order that transcends the mundane order of existence; its aime is not to encourage or discourage either a devotional or a soteriological interest in Buddhism. Melford Elliot "Mel" Spiro (April 26, 1920 – October 18, 2014) was an American cultural anthropologist specializing in religion and psychological anthropology.